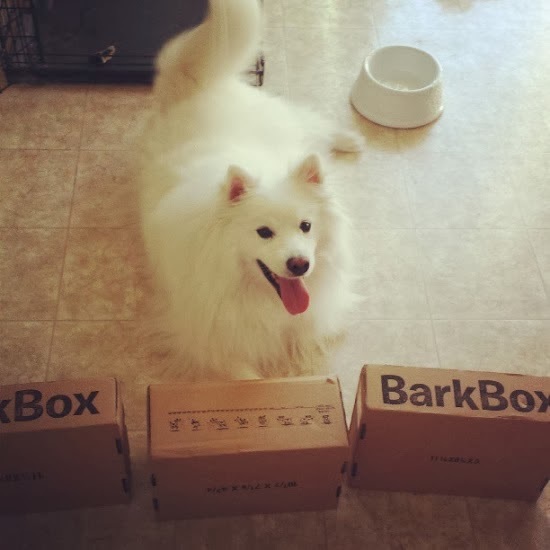 Ruckus the Eskie: BarkBox Promotion - $10 off any new subscription! BarkBox is putting on a promotion from today until January 3rd, 2014. When you start a brand new subscription to BarkBox, you will get $10 off! That means for a single month subscription, your total will be $19 instead of $29! Take advantage of this limited time offer! And while you're at it, why not enter in raffle for a free three-month subscription? Disclaimer: We received no compensation for this post. This site may contain affiliate links. Sometimes bring on top of the Christmas shopping means I miss good deals. Maybe inJanuary! Sometimes bring on top of the Christmas shopping means I miss good deals. Maybe in January! Lucky you Ruckus, enjoy all those goodies. #69 in the hop if you wanna come on by! Hmm, tempting. Maybe for the new year. Have a super duper Wednesday! Hey Ruckus! :) Thanks for sharing the coupon info, $10 off is a pretty sweet deal! I keep seeing BarkBox on many blogs. It has such fantastic goodies inside! olivia wants to receive bark boxes! We have a Bumi and Love it (because of the replacement deal!) It's a great outside toy. The fetch and glo also sounds like a greta outside toy! We have tried YumZies BBQ chicken minis so we'd like to try this flavor too! Hmmm...Box #1, #2, #3...decisions, decisions!